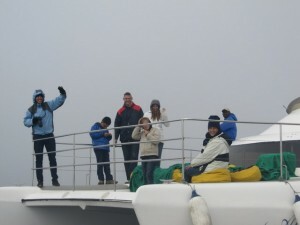 An update from Brittany Dolan in Feb 2012: In the summer of 2010, I was an intern with the Namibian Dolphin Project. It was an amazing experience spending everyday surrounded by dolphins, whales, pelicans, seals and the never ending beauty of Namibia and its people. After my internship ended, I came back to school at the University of Hawaii at Hilo to finish my degree in Marine Science and Environmental Science. Just before my return, a Blainville’s Beaked Whale stranded on Maui and came to Hilo for rehabilitation. Shortly after I got a job with the Hilo Marine Mammal Response Network and the Hawaii Cetacean Rehabilitation Facility where I spend my days with Hawaiian Monk Seals and a variety of cetaceans found around Hawaii. Since then, I have also earned two other marine mammal internships and plan to continue my education after I earn a Bachelors. When I look back on the path my life has taken, I know that the Namibian Dolphin Project started it all and helped me find my passion for marine mammals. I learned field skills in Namibia that I use daily and my time with the Namibian Dolphin Project has shaped my career goals. The time I spent in Africa changed my life and I long for the day when I can return!